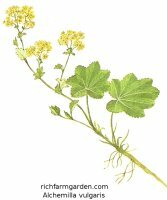 Alchemilla (Lady's Mantle) - Alchemilla vulgaris - Perennial - Medicinal - One of the few truly green flowers found in the garden. Pretty chartreuse colored flower brackets are held above grey green foliage. Good dried flower for arrangements. Used for centuries to treat lack of appetitite, menstrual disorders and rheumatism.